Protein promotes hair growth by helping the body to produce keratin, which is key to the formation of hair. Without keratin, hair growth slows and hair strands are weakened. Because protein is important for strong, healthy hair, it is essential to get key amino acids (the building blocks of protein) in your diet, either through food or through hair growth supplements. One of the most nourishing types of protein for hair is marine protein from seafood, fish and shellfish. “Protein is necessary for the growth of all cells,” says nutritionist Joy Bauer, “including hair cells.” Seafood is not only a rich source of protein but it’s full of essential fatty acids (EFAs), iron, zinc and vitamin B3 (Niacin). In fact, in a 2012 clinical trial conducted by Dr. Glynis Ablon, women who took a marine-based hair growth supplement had a 125% increase in the number of terminal hairs after 3 months. If your diet lacks protein, over time hair can enter the resting (Telogen) phase of the hair growth cycle. Ultimately, this can lead to excess shedding during the transition (Catagen) phase a few months later. Nutritionists recommend that at least 15% of your daily caloric intake should come from protein. Marine proteins that are especially effective in nourishing hair are oysters, salmon and clams. These foods are rich in protein and key hair growth vitamins and minerals. 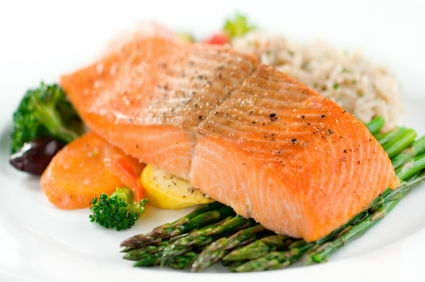 Salmon supplies omega-3 fatty acids and vitamin B3 (Niacin), and oysters and clams are rich in zinc and iron. However, if you are like millions of other Americans who do not live in coastal regions with easy access to fresh seafood, try a clinically proven, drug free hair growth supplement that provides the most nourishing hair growth vitamins and minerals. Zinc nourishes hair by regulating the production of the hormones, androgens. Low levels of androgens are associated with hair loss, slowed hair growth and dandruff. Omega-3 fatty acids help support a healthy, hydrated scalp, minimizing dry, dull and brittle hair. Iron is an essential mineral that helps to make red blood cells to carry oxygen around the body to all cells, including those in hair follicles. Hair loss is often one of the visible symptoms of iron deficiency (anemia). Vitamin B3 (niacin) is essential to maintaining healthy cells. Niacin helps facilitate hair growth by preventing hair shedding, dullness or brittleness.